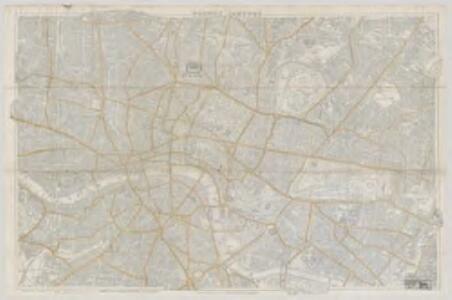 This untitled map of London features scale bar at top left. The city boundary is marked in red, with open land, such as parks and gardens, in green, and the Thames, docks and canals in blue. The map clearly labels the contemporary development of the railway lines, with the Birmingham railway shown intersecting the Regent's Canal at Camden Town. The canal, enthusiastically promoted by architect John Nash, was built to facilitate the import of goods from the provinces. Constructed at the beginning of the era of sustained railway development, however, it never fulfilled its potential and became obsolete.